The past year for me has been all about the PlayStation Vita. That's probably a weird sentence for people to read considering... well, it's the PlayStation Vita. Who cares about the Vita? Well, this guy does! I completely understand why people would not be on board with this little system, but read on to find out a bit about what I found when I dove into it a bit more. It has gone through a system redesign which controversially changed the type of screen the system has from an OLED display to an LCD one. It has received criticism for having proprietary memory cards that are far too expensive for their capacity. It is referred to smugly as a "port machine" by its detractors. The Vita is more or less shunned by most gamers. And I understand why. At least, I understand why most gamers would ignore it in favor of Nintendo's 3DS as their handheld of choice. In early April of 2014 I decided I wanted to try to buy every retail release for the Vita. From what I had seen in stores, the vast majority of the games were under $20 each, which is pretty affordable for a brand new game most of the time. The first batch of games I bought for the Vita when I started trying to get all of them was Ninja Gaiden Sigma Plus, ModNation Racers: Road Trip, Little Deviants, and Lego Legends of Chima: Laval's Journey. Not a lot of quality in that line-up, but I didn't pay more than $9.00 each for any of them. I was hooked on accumulating those little blue cases instantly. 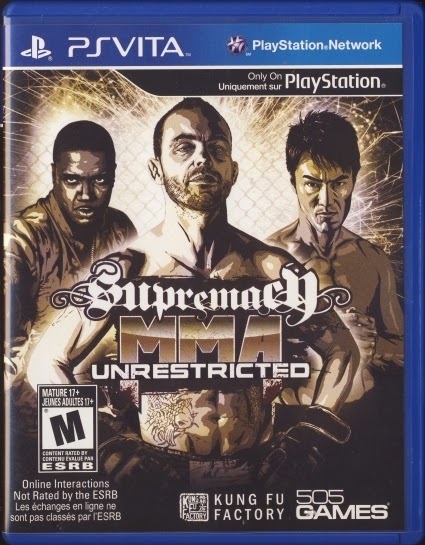 Strangely, Supremacy MMA Unrestricted was one of the most difficult Vita games for me to get. That doesn't mean that it cost me a lot (It too was $9.99), but I had to have my local GameStop transfer a used copy of it in from another store for me. Typically I get my Vita games from either Amazon or GameStop. This is because there is typically no Vita presence in other retail stores. I always compare the prices between the two places and sometimes the Amazon prices are out of control. Currently, Supremacy MMA Unrestricted is on Amazon for $49.99. Used copies there range from $14.99 all the way up to $70.00. I'm so particular about the condition of my games that I won't risk buying a used one online out of fear that the case will be punctured or damaged in some way. But $70.00, though... and it says it's the game only in a blank case. Why does this game cost so much? There's no way that it's all that rare or desirable. 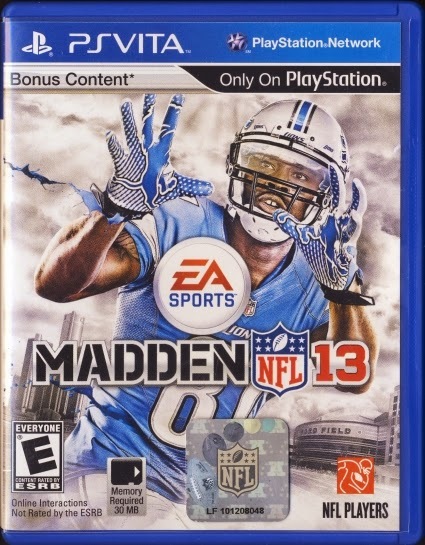 Another difficult one to find was Madden 13. Currently the Vita version is selling new for $69.99 with used ones ranging from $24.99 up to $69.99. This is another case of a game you wouldn't think would cost a fortune actually does for some reason. To be fair, those are just Amazon prices. I actually had my local GameStop transfer one of those in for me as well and it was only $19.99. It took a few tries for them to locate a copy that actually had the case, though. As small as Vita games are, I can't imagine why anyone would throw the case to one of them away. The cases themselves are small as well. You're not going to save much space by discarding it. It's always a shame when you find a game you've been after only to discover that someone has thrown the case away for it. Cardboard boxes are one thing, but I'll never understand people throwing away the plastic cases games come in. When I began trying to obtain all the Vita games, I created a spreadsheet of every game available and added to it as games were released. One day I was on Digital Press and I was reading a thread in the forums about all the games that had come out. 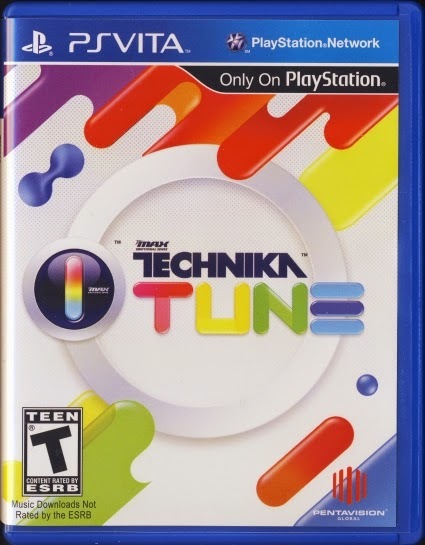 On that list was a game called DJ Max Technika Tune. I had never heard of it before and didn't see it on my original source of released games. So I researched it and discovered that it was an actual physical release game. I almost missed it completely! I bought it on Amazon and it was $49.99, which other than some elaborate collector's edition games I bought, is the most I have ever had to pay for a Vita game. Looking it up now, it appears to have dropped slightly to $44.99. I tried to get it at GameStop, but it apparently wasn't even in their system. 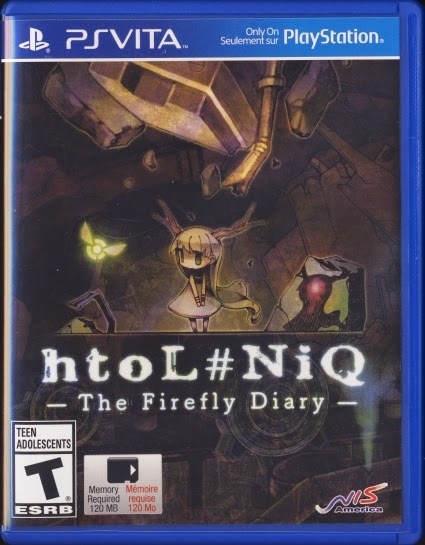 Another game I almost missed completely was htoL#NiQ: The Firefly Diary. It was released on NIS America's website in extremely limited numbers for $19.99. It came out during the busy Christmas season for me and it completely flew under my radar. I had about given up hope on ever getting it until I noticed a link on GameFAQs one day saying it was for sale on Amazon for $49.99. I knew the price would only go up, so after a little back and forth in my head, I went ahead and paid a premium for it. I didn't want that to be one I never got! So that one actually is rare, unlike some of the other ones I had trouble finding. There is something strangely addicting about buying Vita games. I don't know if it's their diminutive size or what, but I always feel like I need to buy more than one whenever I get one. That could also be the collector in me trying to get them all, though. They look so nice on the shelf side by side, too. The hunt for games I needed in the beginning was pretty thrilling as well. I'd go to every store and check out their Vita selection, hoping to stumble across something I didn't see that often. Sometimes I would, mostly at GameStop, but most of the time it was just the same stuff every other store had. There were always the same budget releases available at Best Buy. Toys "R" Us always had mainstream games that were available everywhere else. Wal-Mart had the same thing as Toys "R" Us with a few others but they're all bleached out from being under the fluorescent lights so long. Online shopping for the Vita really is the only way. Stores just don't carry much for it. Normally, attempting to buy every game for a currently supported system is not feasible. The only other current system I can think of that you could even begin to do that with would be the Wii U. With the Vita, though, over the past few months, there has only been a trickle of releases for the system. Games typically don't come out in physical versions on the Vita, and the ones that do are few and far between. It allows you to take your time getting the games you need without breaking your wallet. Most of the games coming out for it are games that appeal to me that I would have bought anyway, and the ones that don't appeal to me are more than likely going to be discounted within a month or two. Games I would have bought for the Vita anyway. In the end, the last game I needed to complete the set was Fifa 15, and not because it was rare or anything, but because I was just too cheap to spend $39.99 on it. It was a satisfying feeling knowing I could complete it at any time without worry of some game being my white whale. The Vita has something for everyone. It might not have enough to justify a purchase from everyone, but if you have a broad taste in games, it has a pretty good library to choose from. I didn't even mention the games you can get on the PlayStation Network for it, even if you do need a ridiculously overpriced memory card to get any use out of it. The PlayStation Network actually does see a lot of releases. Definitely more digital games are released for the Vita than physical ones. So if you choose to start collecting for the Vita, know that it's a pretty easy collection to assemble and you won't go broke trying to finish it. There are some here and there that cost a bit, but nothing that's going to stun you. There are less than ten new physical releases coming out for it between now and the beginning of September, so it's still a doable task. Of course, all that could and probably will change if they announce a bunch of games during E3. We'll see!